Mr Foot, who farms at Caundle Marsh near Sherborne, is one of 60 farmers who supply Waitrose with milk. All participate in the Waitrose WildCare wildlife habitat scheme, which encourages farmers to use farming practices that actively encourage animals, plants and insects to live on their farm. 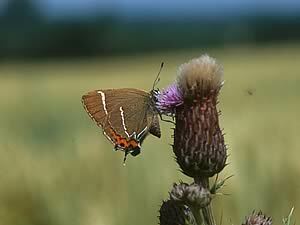 Sixty-seven species of butterfly spend all or some of their time in the UK countryside. Between them the Waitrose suppliers spotted 54% of the nation’s butterfly species. Mr Foot alone spotted almost 40%, including the Dingy Skipper, the White-letter Hairstreak and the Small Heath, which are regarded as endangered by the UK’s Butterfly Conservation organisation. The Waitrose WildCare scheme is administered and monitored by wildlife experts from AB Sustain. “Butterflies are very sensitive to environmental change, which makes them a very good indicator of the health of the countryside,” says Waitrose WildCare manager Tim Oliver. 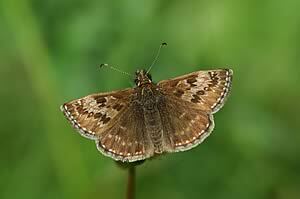 “If a habitat is good for butterflies, it is usually good for other wildlife. They also play their part in the pollination of plants and the caterpillar stages provide food for birds. Sadly though, most species are in decline. A bout of flu in June helped Mr Foot in his search, as it allowed him to spend two weeks walking the farm with his dogs whilst recovering. Armed with the camera on his mobile phone, he spent hours looking out for butterflies. He verified his sightings by using the identification wall chart provided by Waitrose and a reference book in the farm office. Mr Foot received a case of Waitrose wine as a prize which he shared with his wife and farm-staff, who helped to record the butterflies. Five other dairy farmers in the group also spotted more than 20 species of butterfly on their farms.